Resonant is revolutionizing the way RF filters are designed and a big part of that is building an ecosystem of filter foundries and packaging partners to provide licensees of its Infinite Synthesized Network® (ISN®) technology with a complete set of foundry choices and services to speed their products to market. The Resonant Infinite Synthesized Network Foundry Program provides fabless licensee partners with all of the services they need to produce ISN-developed filters. ISN Foundry Program members are highly experienced and high-quality foundry and backend service providers that have been successful working with filter designs created with Resonant's ISN design methodology. 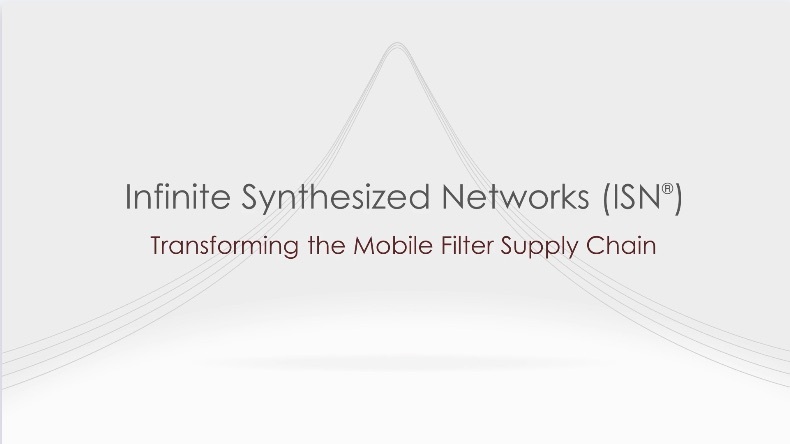 Watch this video on how Resonant's Foundry Program is transforming the mobile filter supply chain. Foundries joining Resonant's program first complete the foundry evaluation process with Resonant to ensure alignment with Resonant's customers for filter performance, manufacturing quality, and business practices. Once the evaluation is completed, the foundry runs a single characterization lot, then Resonant is ready to start designs for manufacture in the foundry immediately. Packaging/back-end vendors can join the program by completing a back-end evaluation process to match their capabilities with foundry partners and Resonant's customers. ISN allows filter designers to create RF filters for difficult bands and complex carrier aggregation and other requirements. ISN leverages Resonant's extensive suite of proprietary mathematical methods, software design tools and network synthesis techniques in order to explore a much bigger set of possible filter solutions and quickly derive the best design that still leverage today's state-of-the-art manufacturing methods. Filters are critical components for next-generation mobile devices, self-driving cars, aviation and medical applications. The ISN Foundry Program gives filter designers a stable and experienced supply chain that can produce these critical parts. If you are a foundry and would like more information, click here to email the Resonant team. Similarly, if you are a fabless filter designer that would like to engage with the ISN Foundry program, click here to email Resonant.